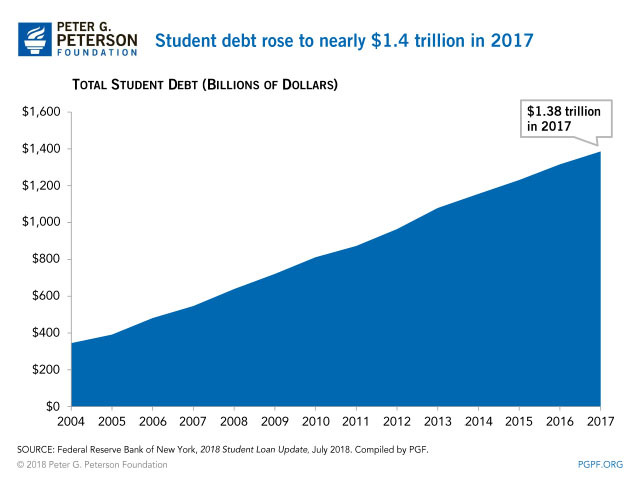 • At the end of 2017, nearly 45 million Americans owed a total of $1.4 trillion dollars in student debt. 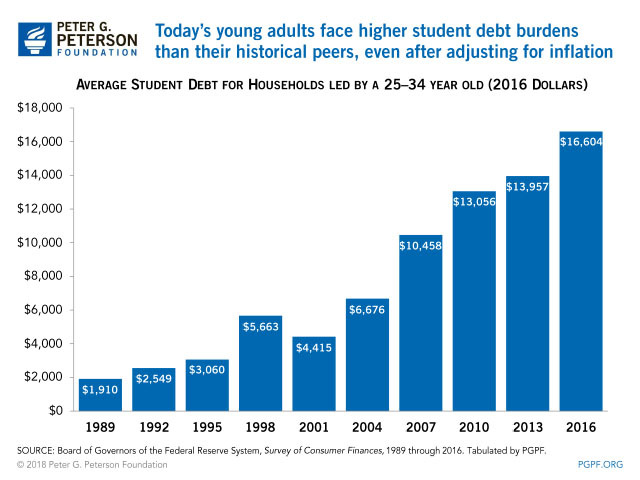 • Young adults are more likely to be burdened with student debt than in the past and the average amount outstanding has grown significantly. 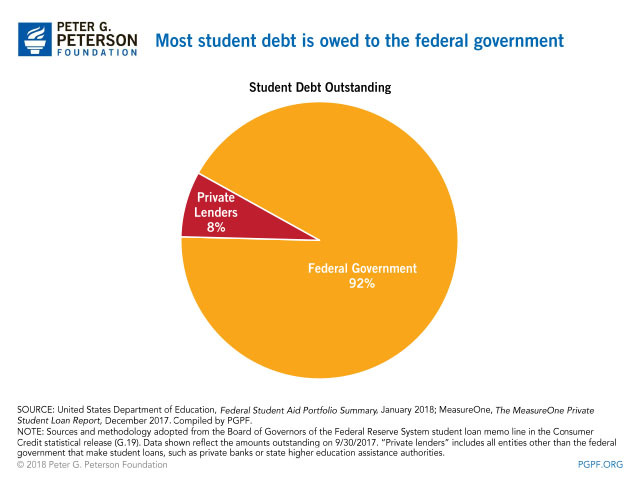 • Most student loans are disbursed directly by the federal government. While post-secondary enrollment has increased modestly in recent years, student debt has grown at a much faster rate. From 2004–2017, student debt quadrupled, rising from $345 billion in 2004 to nearly $1.4 trillion in 2017. In that same time, according to data from the National Center for Education Statistics, undergraduate student enrollment rose by approximately 15 percent and post-graduate enrollment by 17 percent. 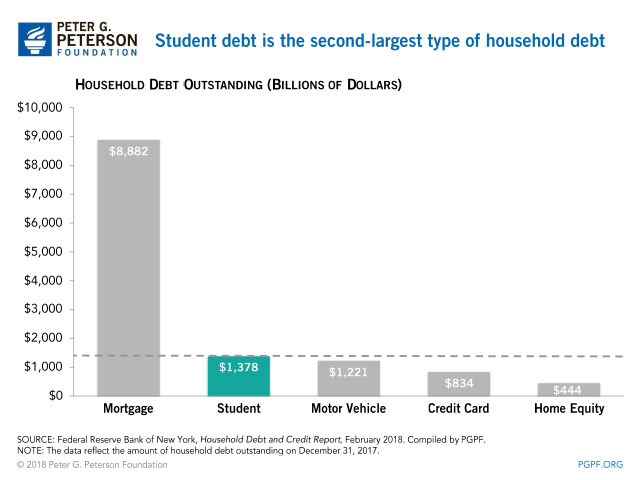 How Does Student Debt Compare to Other Types of Household Debt? 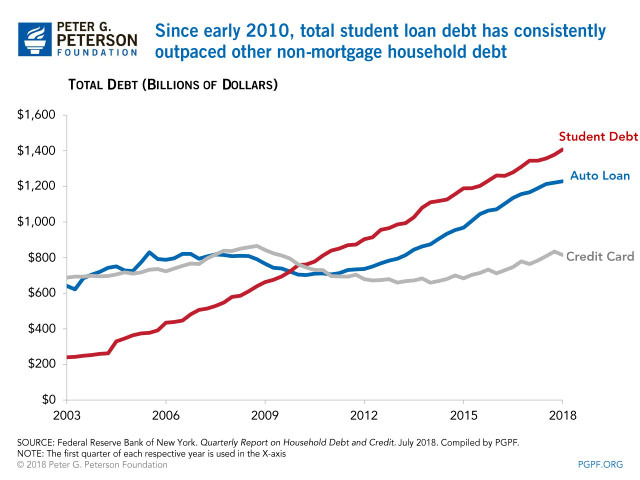 Student loan debt is the second largest source of household debt in the United States. The largest source is mortgage debt, which totaled nearly $9 trillion at the end of 2017. Since 2003, student debt has risen at the fastest rate of any other household debt and surpassed both auto loan and credit card debt in 2010. Student debt has become significantly more prevalent among young adults since 1989. The percentage of households headed by Americans ages 25–34 that are burdened with student debt has more than tripled, from 15 percent in 1989 to 46 percent in 2016. In addition to the growth in the number of young adults who take out student loans for their education, the average dollar amount owed per household has increased as well. 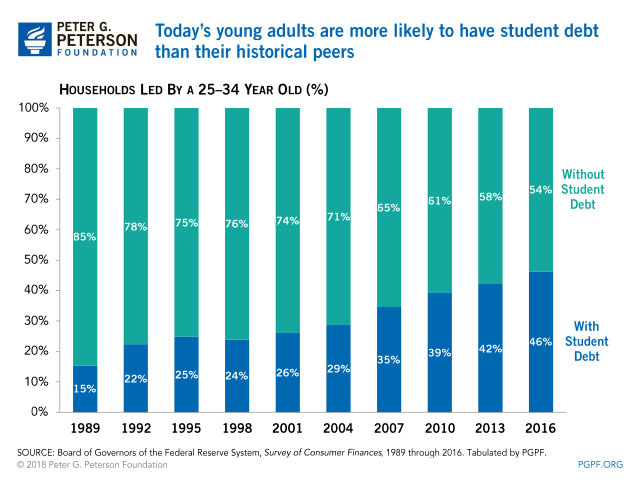 Even after adjusting for inflation, young adults in 2016 faced a much higher student debt burden than their historical peers. 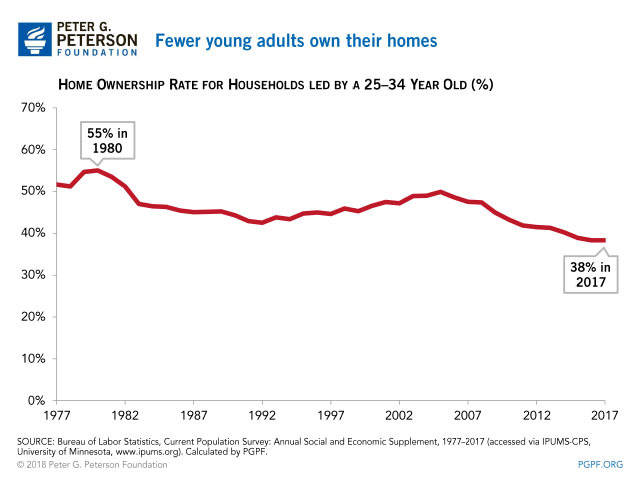 Research by experts at the Federal Reserve Bank of New York indicates that the increasing amount of student debt is an important factor in the flagging homeownership rates of households led by Americans ages 25–34. In 1980, 55 percent of such households owned homes compared to just 38 percent in 2017. Home equity is a major contributor of retirement security, and delayed home ownership for young Americans can limit their long-term wealth accumulation. Who Owns All This Student Debt? The Department of Education reports that 92 percent of all current student debt is owed to the federal government, with private financial institutions lending the remaining 8 percent. That distribution is significantly different than a few decades ago. Prior to the 1990s, most student loans were subsidized and guaranteed by the federal government, but provided by private lenders under the Federal Family Education Loan (FFEL) program. In 1992, the federal government implemented a new direct lending program. However, it was not until 2008, when large-scale credit market disruptions hampered the ability of many private lenders to make loans under FFEL, that the amount of direct loans from the federal government began rising substantially. Data from the Federal Reserve Bank of St. Louis show that in 2008, about $140 billion in student debt was directly loaned by the federal government; however by the end of 2017, total direct loans by the federal government had reached $1.15 trillion.